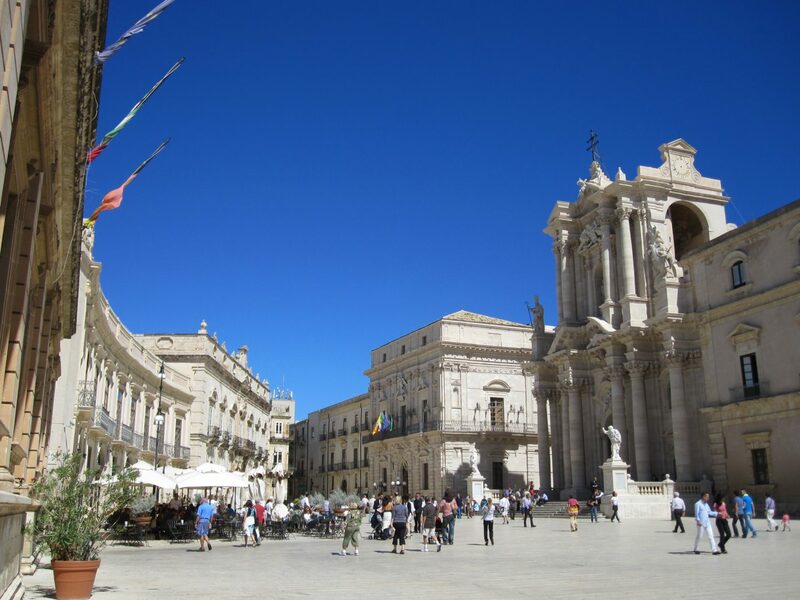 The first stop on our spring 2017 trip through eastern Sicily was Syracuse (Siracusa in Italian), in the south east of the island. 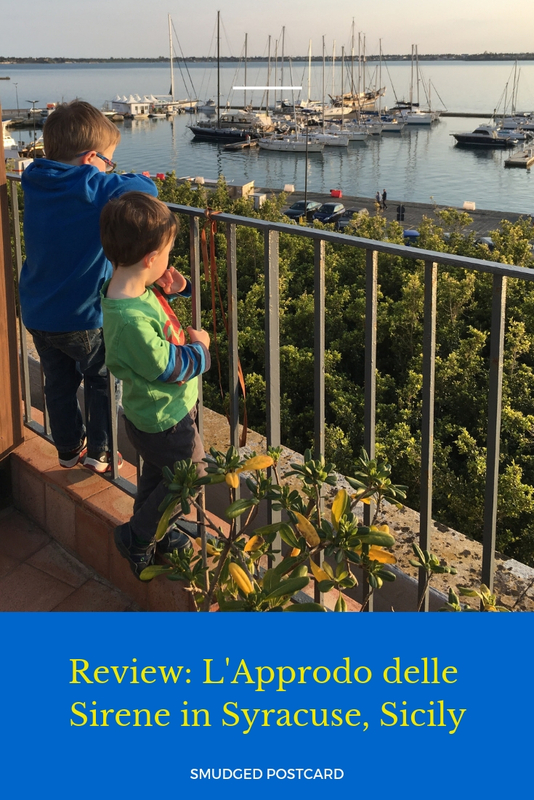 I wanted to give my boys a perfect introduction to Sicily and my favourite Sicilian city so I booked us into L’Approdo delle Sirene, a delightful bed and breakfast occupying two floors of a waterfront palazzo on the edge of Syracuse’s old town, Ortigia. Approdo delle Sirene has a waterfront position. Although a bed and breakfast, Approdo delle Sirene feels more like a hotel. The eight rooms are stylish with modern bathrooms and a contemporary feel. Some of the rooms overlook the harbour while others have a skylight window, all are light-filled and spotlessly clean. 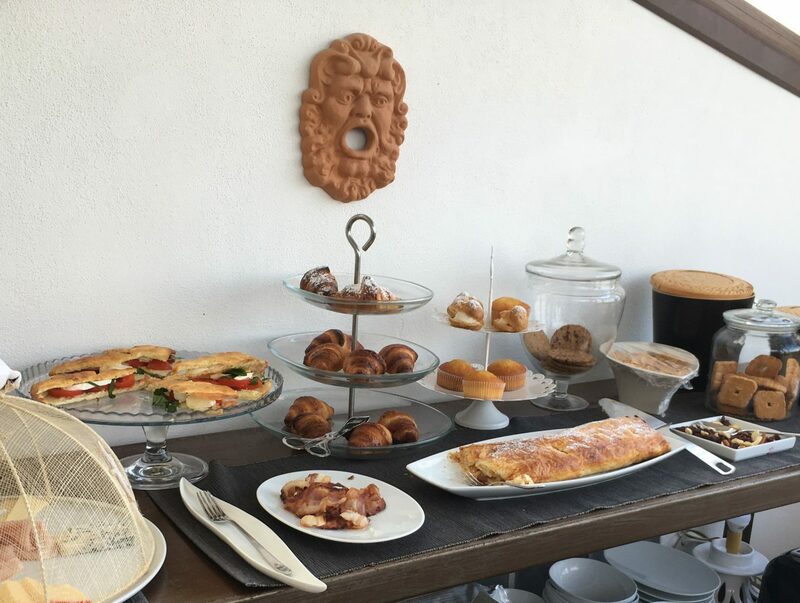 The staff are incredibly friendly and helpful and the owner, Fiora, runs cookery classes on request and cooks the delicious cakes served up at breakfast. 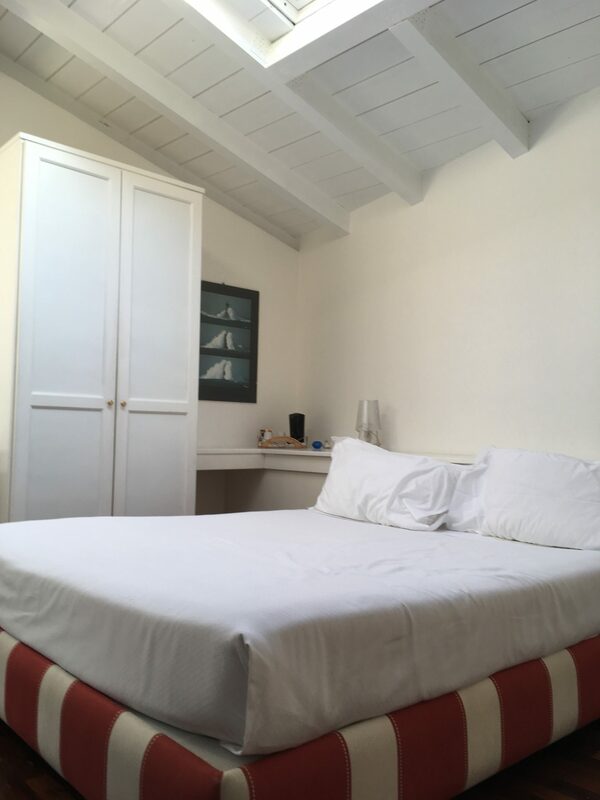 L’Approdo delle Sirene is excellent value, currently double/twin rooms cost from €85.50 per night with breakfast, based on two adults sharing. If you’re travelling with one child, some of the rooms can fit an extra bed or cot. If you’re travelling with two children as we were, you can book the set of interconnecting rooms. This does make for a more expensive stay but as I’d found some cheaper options for other parts of our trip I decided this would be a treat for our first two nights. It meant we had plenty of space and when our boys (five and three at the time) were tucked up in bed, we could close their door and retreat to our own room. The breakfast room at L’Approdo delle Sirene has big windows overlooking the harbour. There are steps from there onto a terrace where we took breakfast on our first morning, the kids loved looking at the boats while they munched on homemade cakes, pastries and fresh fruit. Us adults could have happily spent several hours on the terrace sipping delicious coffee and feasting on second and third helpings of pastries but as the children were a bit noisy we decided we’d better head out and explore Syracuse. Ortigia is separated from the rest of Syracuse by two bridges. Many of the narrow streets and piazzas are car-free so tourists tend to leave their vehicles at a car park on the edge of the island. We found it pretty straight forward (by Sicilian driving standards) to drop off our luggage at L’Approdo delle Sirene and then park our car and walk back. 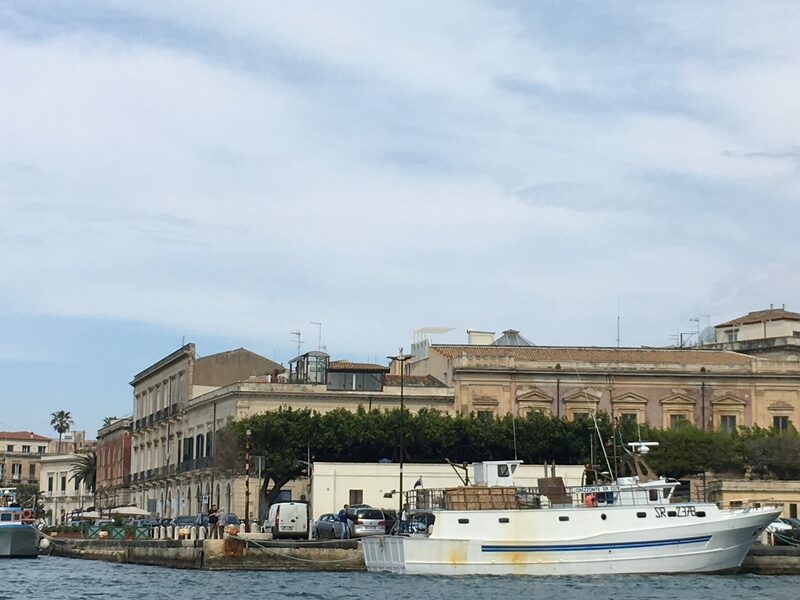 As Ortigia is pretty small (not much more than a square kilometre), everything is within easy walking distance from L’Apporodo delle Sirene. And with few vehicles it’s an enjoyable city to explore with young children. Highlights for my boys included Castello Maniace, a 13th century castle lapped by the waves, a visit to a traditional puppet show and of course endless ice creams and pizzas. 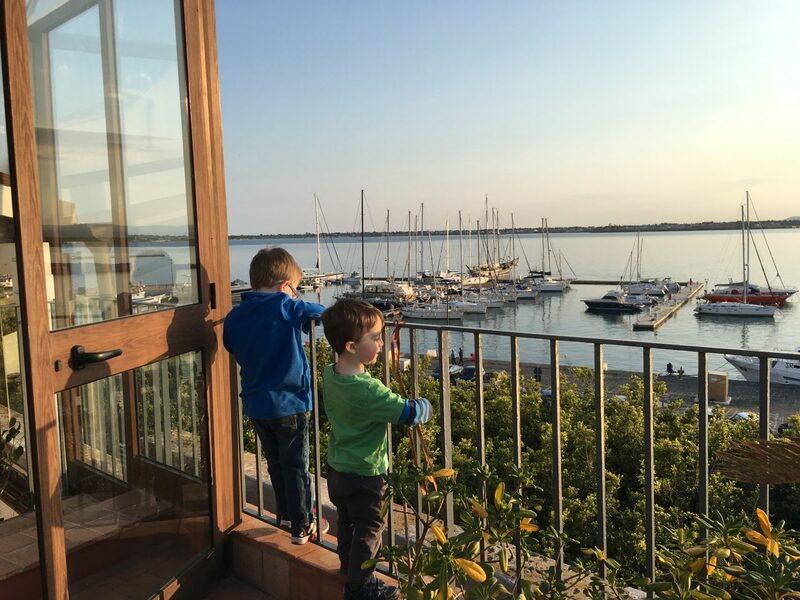 If you’re after a fun and relaxing break with children, staying at L’Approdo delle Sirene in Syracuse, Sicily takes some beating. I really hope we’ll return in the future. Approdo delle Sirene is 60km from Catania airport. We hired a car and drove as we were exploring other parts of the island. If you’re just visiting Syracuse you’re best off hopping in a taxi from the airport, this should cost around €65 if arranged in advance. Syracuse also works well as a twin centre with Taormina, another car-averse city. There is a direct rail link between the two cities, the journey time is approximately two hours. 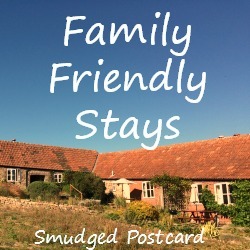 This post is linking up with Family Friendly Stays, a monthly blog link up where bloggers can link their reviews of family-friendly holiday accommodation. If you’re not a blogger, do take a look, you might find inspiration for your next trip. It’s a great destination for families and much more affordable than mainland Italy. Thanks for your comment, glad to hear the link up is useful! Interconnecting rooms are such a treat when traelling as a family! This place looks fabulous.Sicily has long been on my travel bucket list, and your post just reminded me of that! Yes, interconnecting rooms are so important, it’s a shame more hotels don’t do them. Yes, the view was a good way to keep the boys occupied while we enjoyed a leisurely breakfast! Sicily is on my bucketlist. I was thinking Palermo but I’m going to add Syracuse now as this looked lovely. They’re very different cities. Syracuse is very peaceful and relaxing and pretty while Palermo is a typical port city, rather rough but with great character. I like them both!